On August 11, the first Cross Strait Student Baseball League Taichung Station (second phase of the semi-finals) started. Cross-Strait Students Baseball League is by far the largest cross-Strait single sports exchange events. Zhang Zhijun　(張志軍), director of the Taiwan Affairs Office of the State Council, Hao Longbin (郝龍斌), vice chairman of the Chinese Kuomintang, Wang Weizhong, member of the Standing Committee of Guangdong Provincial Party Committee and secretary of the Shenzhen Municipal Party Committee, Chen Rugui, mayor of Shenzhen, first vice president of the World Baseball and Softball Association, Peng Chenghao (彭誠浩), president of the General Assembly, attended the opening ceremony and jointly kicked off the competition. Zhang Zhijun said in an interview with the media that baseball has become very popular in Taiwan and has also risen in mainland China. Shenzhen set up a very good platform for cross-Strait baseball sports as well as a bridge for young people on both sides of the Strait to exchange and communicate with each other. He said he hopes the league will run on an annual basis and will do better and better so as to promote the development of baseball in mainland China and make due contributions to the mutual understanding and common development of young people on both sides of the Strait. The current finals by the Shenzhen Municipal People’s Government and the Cross-Strait Baseball Exchange and Cooperation Committee co-sponsored the slogan is “great city, great club”, participating athletes, referees, technical officials 785. The active participation of hundreds of primary and secondary schools in multiple cities across the Taiwan Strait has “brought vitality and vitality to the league and made the cross-Strait baseball show a bright future and a bright future.” The Cross-Strait Baseball Exchange and Cooperation Commission Chairman Wang Jianwen pointed out in his opening speech. Peng Cheng-hao believes that students from both sides of the strait should devote themselves to baseball as much as possible while also merging their friendship through mutual exchange. Youth heart to heart. “Chen said that sincerely hope that young athletes across the Strait, match out” great achievements “,” stick of friendship “, leaving” great stick of memory. ” He said Shenzhen is a young, open, inclusive and energetic city and hopes that more Taiwan compatriots and students will visit Shenzhen for exchanges and start their own businesses. After the opening ceremony on the morning of the same day, the opener at Xiamen University VS Shixin University opened. “Cross-Strait Students Sports Development Summit” was held the same afternoon. On the 3rd, all finals will be over and awards will be given. In the following two days, exchanges and visits to the two sides of the Taiwan Strait will be held one after another. The first cross-strait student baseball league review photo exhibition and other exchange activities will also be carried out during the competition. The tournament is considered a cross-strait technical exchange, Chinese Taipei Baseball Association secretary-general Kung Fu-hao said, adding that it aims to mutually improve skills and does not involve politics. Taiwan and China held an exchange tournament eight years ago, Kung said. Because the two sides speak the same language and Taiwan is more skilled in baseball, China hopes to use this tournament to improve, he said. Because the US and Japan are more skilled, Taiwan often competes against the two nations to identify its weaknesses, Kung said, adding that the cross-strait tournament had a similar starting point. According to Chinese media, the event was attended by 785 athletes, referees and government officials. Apart from China’s Taiwan Affairs Office Minister Zhang Zhijun (張志軍), Chinese Nationalist Party (KMT) Vice Chairman Hau Lung-bin (郝龍斌) and Taitung County Commissioner Justin Huang (黃健庭) of the KMT also attended the opening ceremony, the reports said. Zhang was quoted as saying that he hopes the tournament can be organized every year. The 16 participating Taiwanese schools — consisting of colleges, high schools, middle schools and elementary schools — included Chung Yuan Christian University, Shih Hsin University, National Taiwan University and National Pingtung University of Science and Technology. 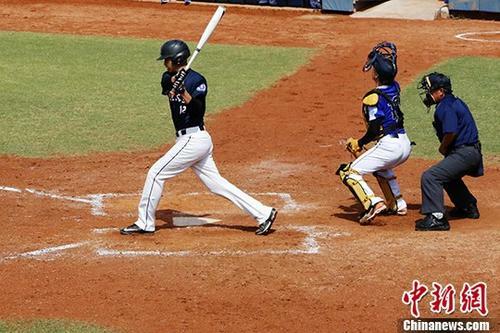 Chinese media reported that the tournament was organized by the Cross-Straits Baseball Exchange and Cooperation Committee, which was coestablished by the Federation of University Sports of Beijing Baseball and Softball Branch and the “Chinese Taipei Baseball Association” (中華台北棒球協會). The “Chinese Taipei Baseball Association” was also a cosponsor in name, the tournament followed the Olympic model.